The Nanomuseum, a conceptual museum idea that is housed in a folding 2×3 inch frame with space for two artworks, was began in 1994. 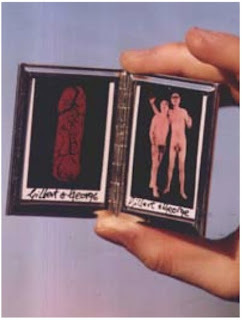 Several exhibitions occured, including the work of Gabriel Orozco and Gilbert and George (above). The final exhibit was to be put together by artist Douglas Gordon, but he lost the tiny museum at a bar. Hmm. Now, the space in Beijing, a gallery and creative organization in Jianwai SOHO has proudly reopened the Nanomuseum as of Jan. 1st, 2010. The first exhibition will be organized by Chinese artists Sun Yuan and Peng Yu. To see the official blogpost about the grand opening, click here, and scroll down to read the english.